And now for something completely different…I’ve started making my own kefir at home and I have to say, I’m hooked. 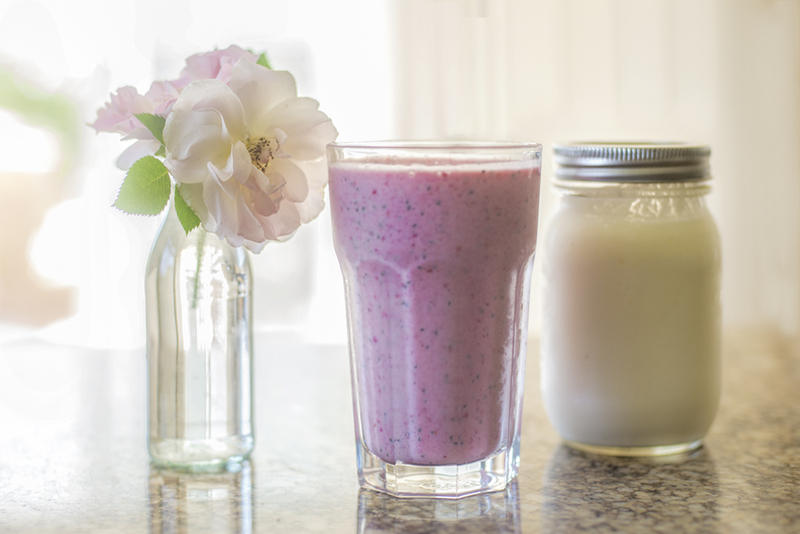 Imagine yogurt in a drinkable form and with even more nutritious goodness. Kefir (pronounced ka-FEER) is made by fermenting milk using bacteria and yeast. In both yogurt and kefir, bacteria ferments the lactose found in milk into lactic acid, giving these products a tangy flavour. But kefir has three times the probiotic content — the “healthy” bacteria that block harmful bacteria from living in your gut — that yogurt has, so it is great for digestion. This can also boost the immune system. Kefir is also a fantastic source of calcium, B vitamins and phosphorous. It’s a low-fat source of protein, too. It is super easy to make, requiring only milk (or coconut milk or even water) and kefir grains or starter. You don’t have to heat it as you do yogurt. Just let is sit on the counter at room temperature for 12 to 48 hours. Mine was ready in 12. It is milder in flavour than yogurt and makes delicious smoothies. There is a great deal of research going on these days pointing to the connections between the health of our digestion system and our health in general, and the micro biome is receiving lots of attention. One fascinating area of research is also looking at how the health or our gut affects the health of our brain and our moods. I’ve been using goat milk kefir for awhile now. Thick and fabulous. pricy but worth it. If I had goats I’d make some. We actually have access to a dairy with unpasteurized milk. In order to ‘buy’ it tho, you actually own shares of a cow because it’s illegal to sell milk that way. I’ve cut way back on the gluten and sugar the [past few years and am looking to buy a Vitamix in a few weeks so I guess i’ll officially be a health food freak. Thought about a juicer but I do love my smoothies. Here’s to a healthy gut! Ok I bought some Kefir, peace. I’m impressed with the protein value and surprisingly it taste really good. Reminds me of buttermilk, which I love, but better. I’m going to get strawberry night time, toss in some fresh berries and a Sigg’s yougert (try that brand if you haven’t) and give it to the boys for a high protein fruit shake. They love shakes. Thanks so much for sharing that post Sherry. mmmm Sherry that looks good. Have you tried Tumeric milk ? My daughter swears by it. I too have taken on a new way of eating…great post. wow, you make this look so appealing with the soft yet bright light and your presentation. But, I think I’ll still pass 🙂 On that same topic, I watched a really great documentary featuring Michael Pollan and some scientists and was relieved to learn that the simple act of eating a variety of foods every day (whole, non-processed) builds the good bacteria in our gut. My biggest problem these days is two-fold: eating too much and snacking in the evening — definitely need to drop both those habits!